This book will help you get past the initial learning curve quickly so that you can get started using SSIS to transform data, create a workflow, or maintain your SQL Server. Offering you hands-on guidance, you'll learn a new world of integration possibilities and be able to move away from scripting complex logic to programming tasks using a full-featured language. You will learn from this book: ways to quickly move and transform data; how to configure every aspect of SSIS; how to interface SSIS with web services and XML; techniques to scale the SSIS and make it more reliable; how to migrate DTS packages to SSIS; how to create your own custom tasks and user interfaces; how to create an application that interfaces with SSIS to manage the environment; and, a detailed usable case study for a complete ETL solution.This book is for developers, DBAs, and users who are looking to program custom code in all of the .NET languages. It is expected that you know the basics of how to query the SQL Server and have some fundamental programming skills. "Wrox Professional" guides are planned and written by working programmers to meet the real-world needs of programmers, developers, and IT professionals. Focused and relevant, they address the issues technology professionals face every day. They provide examples, practical solutions, and expert education in new technologies, all designed to help programmers do a better job. This book will help you get past the initial learning curve quickly so that you can get started using SSIS to transform data, create a workflow, or maintain your SQL Server. Offering you hands-on guidance, you'll learn a new world of integration possibilities and be able to move away from scripting complex logic to programming tasks using a full-featured language. What you will learn from this book Ways to quickly move and transform data How to configure every aspect of SSIS How to interface SSIS with web services and XML Techniques to scale the SSIS and make it more reliable How to migrate DTS packages to SSIS How to create your own custom tasks and user interfaces How to create an application that interfaces with SSIS to manage the environment A detailed usable case study for a complete ETL solution Who this book is for This book is for developers, DBAs, and users who are looking to program custom code in all of the .NET languages. It is expected that you know the basics of how to query the SQL Server and have some fundamental programming skills. Wrox Professional guides are planned and written by working programmers to meet the real-world needs of programmers, developers, and IT professionals. Focused and relevant, they address the issues technology professionals face every day. They provide examples, practical solutions, and expert education in new technologies, all designed to help programmers do a better job. Acknowledgments. Foreword. Introduction. Who This Book Is For. How This Book Is Structured. What You Need to Use This Book. Conventions. Source Code. Errata. p2p.wrox.com. 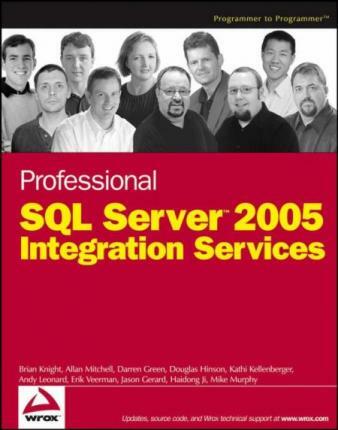 Chapter 1: Welcome to SQL Server Integration Services. Chapter 2: The SSIS Tools. Chapter 3: SSIS Tasks. Chapter 4: Containers and Data Flow. Chapter 5: Creating an End-to-End Package. Chapter 6: Advanced Tasks and Transforms. Chapter 7: Scripting in SSIS. Chapter 8: Accessing Heterogeneous Data. Chapter 9: Reliability and Scalability. Chapter 10: Understanding the Integration Services Engine. Chapter 11: Applying the Integration Services Engine. Chapter 12: DTS 2000 Migration and Metadata Management. Chapter 13: Error and Event Handling. Chapter 14: Programming and Extending SSIS. Chapter 15: Adding a User Interface to Your Component. Chapter 16: External Management and WMI Task Implementation. Chapter 17: Using SSIS with External Applications. Chapter 18: SSIS Software Development Life Cycle. Chapter 19: Case Study: A Programmatic Example. Index. Brian Knight, SQL Server MVP, MCSE, MCDBA, is the cofounder of SQLServerCentral.com and was recently on the Board of Directors for the Professional Association for SQL Server (PASS). He runs the local SQL Server users group in Jacksonville, Florida (JSSUG). Brian is a contributing columnist for SQL Server Standard and also maintains a weekly column for the database Web site SQLServerCentral.com. He is the author of Admin911: SQL Server (Osborne/McGraw-Hill Publishing) and coauthor of Professional SQL Server DTS and Professional SQL Server 2005 SSIS (Wiley Publishing). Brian has spoken at such conferences as PASS, SQL Connections, and TechEd. His blog can be found at www.whiteknighttechnology.com. Allan Mitchell is joint owner of a UK-based consultancy, Konesans, specializing in ETL implementation and design. He is currently working on a project for one of the UK's leading investment banks doing country credit risk profiling as well as designing custom SSIS components for clients. Darren Green is the joint owner of Konesans, a UK-based consultancy specializing in SQL Server, and of course DTS and SSIS solutions. Having managed a variety of database systems from version 6.5 onwards, he has extensive experience in many aspects of SQL Server. He also manages the resource sites SQLDTS.com and SQLIS.com, as well as being a Microsoft MVP. Douglas Hinson, MCP splits his time between database and software development as a Senior Architect for Hinson & Associates Consulting in Jacksonville, Florida. Douglas specializes in conceptualizing and building insurance back-end solutions for payroll deduction, billing, payment, and claims processing operations in a multitude of development environments. He also has experience developing logistics and postal service applications. Kathi Kellenberger is a database administrator at Bryan Cave LLP, an international law firm headquartered in St. Louis, Missouri. She fell in love with computers the first time she used a Radio Shack TRS-80, many years ago while in college. Too late to change majors, she spent 16 years in a health care field before switching careers. She lives in Edwardsville, Illinois, with her husband, Dennis, college-age son, Andy, and many pets. Her grown-up daughter, Denise, lives nearby. When she's not working or writing articles for SQLServerCentral.com, you'll find her spending time with her wonderful sisters, hiking, cycling, or singing at the local karaoke bar. Andy Leonard is a SQL Server DBA, MCSD, and engineer who lives in Jacksonville, Florida. Andy manages a SQL Server DBA Team. He has a passion for developing enterprise solutions of all types and a fondness for business intelligence solutions in industrial enterprises. Learn more at www.andyleonard.net and reach Andy at andy@andyleonard.net. Erik Veerman is a mentor with Solid Quality Learning and is based out of Atlanta, Georgia. Erik has been developing Microsoft-based Business Intelligence and ETL-focused solutions since the first release of DTS and OLAP Server in SQL Server 7.0, working with a wide range of customers and industries. His industry recognition includes Microsoft's Worldwide BI Solution of the Year and SQL Server Magazine's Innovator Cup winner. Erik led the ETL architecture and design for the first production implementation of Integration Services and participated in developing ETL standards and best practices for Integration Services through Microsoft's SQL Server 2005 reference initiative, Project REAL. Jason Gerard is President of Object Future Consulting, Inc., a software development and mentoring company located in Jacksonville, Florida (www.objectfuture.com). Jason is an expert with .NET and J2EE technologies and has developed enterprise applications for the health care, financial, and insurance industries. When not developing enterprise solutions, Jason spends as much time as possible with his wife Sandy, son Jakob, and Tracker, his extremely lazy beagle. Haidong Ji, MCSD and MCDBA, is a Senior Database Administrator in Chicago, Illinois. He manages enterprise SQL Server systems, along with some Oracle and MySQL systems on Unix and Linux. He has worked extensively with DTS 2000. He was a developer prior to his current role, focusing on Visual Basic, COM and COM+, and SQL Server. He is a regular columnist for SQLServerCentral.com, a popular and well-known portal for SQL Server. Mike Murphy is a .NET developer, MCSD, and in a former life an automated control systems engineer currently living in Jacksonville, Florida. Mike enjoys keeping pace with the latest advances in computer technology, meeting with colleagues at Jacksonville Developer User Group meetings (www.jaxdug.com) and, when time allows, flying R/C Helicopters. To contact Mike, e-mail him at mike@murphysgeekdom.com or visit www.murphysgeekdom.com.